Finding the best roof racks can be hectic and daunting, don’t you think? You have all these things to consider like your crossbar type, how to preserve the nice finish on your bike, and which rack actually holds your bicycle firmly onto the car. We can help you with that and narrow your dilemma down to just the best six roof racks there are in the market. Whichever you settle on should be guided by factors in our buying guide and your personal preferences. PS: the decision to buy a roof rack instead of all other types is wise because of the following reasons. Does not hinder your rear view of your vehicle. Gives you enough room to access the trunk. I. How safe are roof bike racks? II. 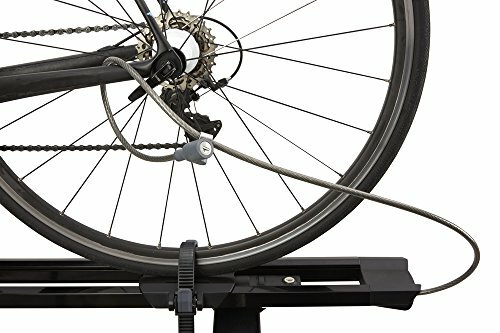 Which roof bike rack is best for my fat-tire bicycle? III. Where are Thule bike racks made? IV. I want to mount a rack on top of my car. 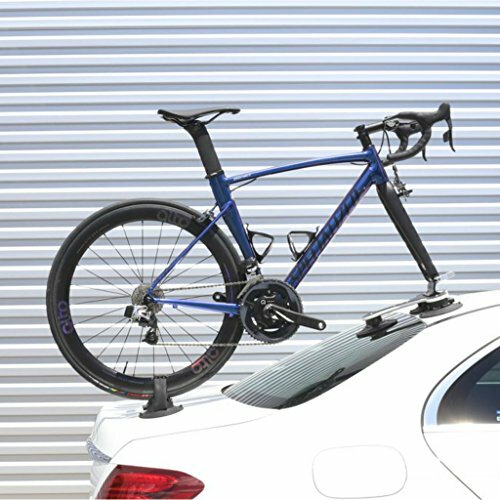 Which roof mounted bike carrier should I buy? 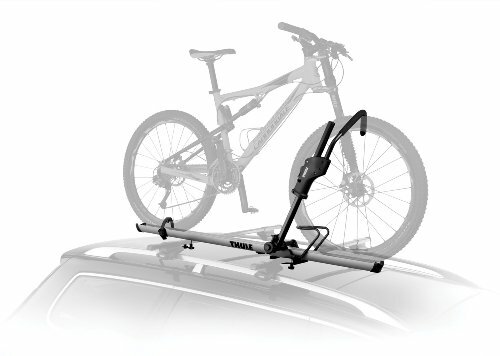 V. Which Thule bike rack is best for the roof? Thule Sidearm Roof Rack is the best because of its firm grip on your bicycle wheels. It has a secure hook and wheel straps for the job. 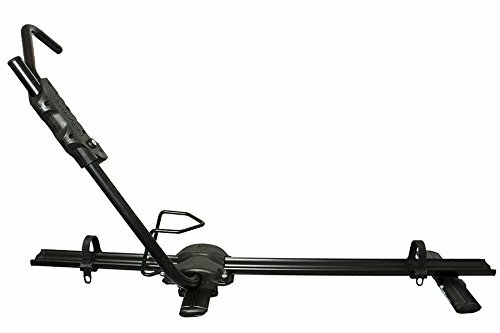 Thule Sidearm roof rack has a secure hook that holds down the front wheel of the bicycle onto the rack. It also has ratcheting wheel straps for the rear wheel, hence giving your tandem a firm grip so that it cannot fall as you move. The rack is made of a corrosion-resistant double wall aluminum tray that lasts long remaining strong and rigid. It is best to buy since it makes no contact with your bike frame. It protects the fancy finish on your tandem. When purchasing it, ensure that your cycle’s wheels are within 20-29”. It cannot hold fat tire bikes. The firm grip this rack gives your cycle without touching the frame is commendable. You will also appreciate the fact that you need not disassemble the front wheel of your bicycle when mounting. It does not have an already integrated locking system; hence you have to buy one separately. A one-key lock cylinder is recommended. Yakima FrontLoader is a rooftop bike rack with the easiest installation procedure, requiring you to have no tools. Yakima FrontLoader rooftop bike rack is easy to install as it comes fully pre-assembled on a purchase. You need no extra tools for the installation, and you can put it on almost all crossbar types. It will fit perfectly on a round, square, factory and aerodynamic crossbar. There is absolutely no need for removing the front wheel of your bicycle when mounting it. The rack makes no contact at all with your cycle’s frame, hence preserving the durability of the paint. If you want to enhance the security of your mounted bike, you can always purchase separate SKS locks and use them. Besides having a limited lifetime warranty, the rack lasts ages and is not hectic to maintain. When installing it, you need not have extra tools for the procedure; it comes fully preassembled. The rack is secure but does not come with an already integrated security system. You will have to buy SKS locks separately if you want to lock up your rack and tandem. RockyMounts TomaHawk is an upright roof rack that is suitable for 99% of crossbars on vehicles. It is suitable for bikes of all sizes. The sturdy from RockyMounts is adjustable to fit on whichever crossbar type you have; a round, square, aerodynamic or factory type. It is one that can hold tires of 5”, hence suitable for fat-tire and mountain bikes. Do not worry about installing it; the process is simple. When loading your bike on the rack, know that it will be stress-free since the rack has easy-load wheel straps for the process. Also, it has no contact with the tandem’s frame, hence keeping it in good condition at all times. The rack works on 99% of vehicle crossbars in the market, thus it is suitable for use on any vehicle. It is also good that loading a bicycle onto the rack is not so daunting anymore. The fact that you need to tighten the bolts really hard when installing makes it a little tiresome. You must tighten them so that your cycle can stay in place throughout the journey. Yakima Highroad is a top car bike rack that assures you of no contact with the bike frame since it grips the tandem by the wheels. To begin with, you do not need to have any tools to install a Yakima Highroad top car rack; it is easy to install. It has universal mounting hardware that allows you to fix it on most crossbars. When mounting the bike, do not remove the front wheel. In fact, have it on, because that is exactly what the racks shall lock against without touching the frame. Moreover, this rack from Yakima has a sleek low-profile tray that gives you maximum tray clearance. It also has a torque tight knob that secures you tandem with precision. If you have a bike of 26-29” wheels or 23mm-3.25” tires, then you have found your searched-for rack. It is very suitable for carbon fiber bikes. The rack is suitable for carbon fiber bikes and has no risk of scratching against the bike frame. For this reason, it is easy to maintain the custom paint on your tandem. It is also nice to know that you do not have to remove the front wheel. Yakima Highroad does not have an already installed security system. For this reason, you have to purchase your own to make it secure from theft. It is also not the one to use if you own a fat-tire bike. A CyclingDeal 1-bike car roof carrier is a secure, sturdy and affordable option of all most roof racks in the market. The rack has a solid steel construction that makes it strong enough to hold a bicycle and durable. It is one that does not require you to remove the front wheel of your tandem when mounting. All you need to do is tie down the straps it has to secure the wheels of the cycle onto the cycle. Note that the installation process of thing CyclingDeal rack is pretty simple. You need not worry about locking up your items; the rack has a lock system included for your bike. You shall also need a few bucks from your savings to purchase it, as it comes at a very pocket-friendly price. It is a recommendation that you mount your bicycle without removing the front wheel. This makes the process easy. All you have to do is tie down the wheel straps and you are good to go. The cycle mounts onto the frame of your rack, therefore, not a very proficient frame protector. If you do not really mind the wellbeing of your or own a cheap cycle, it is the rack for you. Yakima HighSpeed bike rack is what you need if you want your bike firmly gripped on the mount, with a maximum hatch clearance. Yakima Highspeed is a streamlined, versatile roof bike rack that needs you to remove the front wheel when mounting it. It is one that accommodates bikes of all wheel and tire sizes, including road, mountain and fat-tire bikes. It has a new torque right knob that quickly and easily secures the tandem with precision. If you are looking for an easy-to-install rack with maximum hatch clearance, this is the one for you. The rack has a low-profile tray for the clearance and universal mounting hardware to fit on most crossbars. Your bike is fully secured when on this rack, and the installation process needs no tools. This makes it easy to use, and you are assured of efficiency. The rack also does not make any contact with the cycle’s frame. The rack does not have an already installed security system. For this reason, you have to purchase SKS locks separately. SeasSucker’s Talon bike rack is the best for anybody looking for a versatile bike rack that can accommodate any bikes with quick-release front wheels. 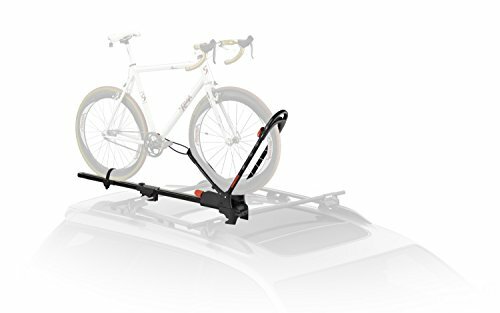 SeaSucker Talon bike rack can mount on not only the roof but also the back glass or truck of basically any car; a sedan, van, hatchback or coupe. It is easy to install, as it uses vacuum cups to mount on the surface, after which you mount the fork of your tandem and strap the rear wheel using the straps. For convenience, you can uninstall it from your car without leaving any marks. It is a lightweight option that can be transported and stored easily. The rack is very easy to install and can be transported and stored easily. It is also one that holds you tandem firmly, both on the fork of the bike and on the rear wheel. The fact that you have to remove the front wheel of your cycle each time you transport it is tedious. The rack cannot mount a bike with the front wheel still in place. Now that you are well versed with the best roof bike racks on sale, it is time to make a choice on what to purchase. There are several types of bike racks that you can choose from, but we will focus on the roof racks. When making a selection, be sure to know how many times you will use the rack, and have it in mind that most of these racks hold only one tandem at a time. Below are factors to use as a guide when shopping. Do you know the diameter of your wheels? There racks that comfortably hold bikes of 20”, others 26” and others 29” and beyond. Knowing exactly the capacity a rack can hold and what size your wheels are will help you in making the right decision. The same case applies to tire sizes. Know the exact dimensions of what you own, then look for the equipment that mounts a tandem in that range. Bikes with fat tires have specific fitting racks, and so do road, mountain, commuter and carbon fiber bicycles. How much can you spend on this item? Does it matter? Note that most of these roof racks are affordable, so you will not suffer much when making a purchase. If the amount of money you spend is not the deal breaker here, then you can buy any rack based on other factors you consider to be critical. As with all other types of racks for cycles, there are the options that require one to remove the front wheel, and there are those that do not. Do you mind this step? If you do, then look for racks that will not have you remove the front wheel. There are plenty of those in the market. However, if this is nothing to you, then purchase one that needs you to remove the wheel. Such is also efficient, and hold your bike with precision. Know how to remove the front wheel of a bicycle before you engage in that step. Such pain when you watch your expensive recently painted tandem with a customized finish being scratched repeatedly by one of the items you bought. Who will you blame? If you value the frame of your cycle that much, look for racks that make absolutely no contact with the frame. Otherwise, you will gnash your teeth with regret. If, however, you do not really mind the look f your frame, or your cycle is cheap and the scratch will not hurt that much, then have any rack, even the one that touches your frame. They are not that bad actually, it is just a few scratches. Normally, roof racks are easy to install. There are those that require tools to install them, but the process is not complicated. They all come with instruction manuals. Others can be installed without the use of extra tools, and come preassembled. It is really your choice to make depending on your preferences. There are racks that have an already integrated security system. These are very convenient since you can leave the bike on the vehicle unattended without worrying about them being stolen. There are also those that do not have a locking system installed in them. This does not limit you to purchasing your own separately; most of them are compatible with high-quality locks that you should buy separately and leave your items secured. Very safe. All roof racks are constructed such that the grip on the bike is firm enough so that it will not fall when you drive. It is important that you install them as per the instruction manuals to nullify falling risks. Also, buy locks if the rack does not have one to keep your bike and rack from being stolen. A RockyMounts TomaHawk Upright Mount rack is the best to use if you own a fat-tire bicycle. It can accommodate bikes of up to 5” tires securely and makes no frame contact. However, if you want to buy from other companies, consider those that have a provision for tandem adapters that can extend to hold bikes with tires sizes above 3”. In Europe and in the USA. Thule being a Swedish company, it has many of its products manufactured in Europe and sold across the globe. The company also has factories in Seymour, CT and Chicago, IL. 75% of the products from these factories are sold in North America. Consider purchasing a Yakima FrontLoader Rooftop bike rack. It is best to use on cars because of the following features. It is easy to install; comes fully pre-assembled and requires no tools for the procedure. It is adjustable to fit most crossbars. It makes no contact with the frame of your bike. It is compatible with SKS locks. Thule Sidearm rack is the best for the roof of your vehicle. It is one that makes no contact with the bike’s frame and is resistant to corrosion since its tray is made of a double wall of aluminum. The rack also grips the rear wheel to the tray using its ratcheting wheel strap and the front wheel using secure hooks. This makes it the best from Thule for the roof. It is not a complicated affair after all. Choosing the best roof rack is not a walk in the park because there so many to choose from and you will be lost for choices. However tricky and confusing it may be, it is not a complicated process at all. Our selections and guide are all you need to make the best decision ever regarding your car and bike. We recommend that you get a Yakima bike rack if you want the best of the best there have ever been. Racks from this company are highly specialized in rooftop mounting and the reviews from clients are overwhelming. Second to them are racks from Thule.